In 2015, Pipex px® worked with London Underground to create an Anti-Trespass and Security Barrier for the transportation sector in Essex, United Kingdom. 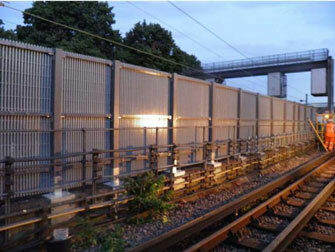 In an effort to protect people and railway tracks, London Underground needed a fabricated and nonconductive screen for the Barking Flyover. KN Network Services and Pipex px® worked together to design a fiber reinforced polymer (FRP) system which allowed air movement while ensuring limited visibility. The barrier system was manufactured from EXTREN® FRP profiles and I-6000 DURAGRID® pultruded fiberglass grating. Outside of the transportation sector, many of Strongwell’s case studies have shown that fiberglass molded and pultruded grating can be successfully used in architectural and industrial applications. In total, three sections provided over 518 linear feet of FRP DURAGRID® screens. In an effort to minimize rail disruption during the installation of over 100 grating panels, Pipex px® prefabricated the interconnecting panels to ensure a quick delivery and drop-in solution for the end user. Upon completion, the barrier system is estimated to provide over sixty years of maintenance-free operation.